Nancy Cunard is having a house-party, amongst the guests are Lytton Strachey and Man Ray (who has a dark-room set up on the premises), as well as two men both of whom are vying for Nancy's attention. This seems to be the premise of Christopher Alden's production of Handel's Partenope which was revived by English National Opera at the London Coliseum on Wednesday 15 March 2017. The production was designed by Andrew Lieberman (sets) and Jon Morrell (costumes) with lighting by Adam Silverman. Sarah Tynan was Partenope, with Rupert Charlesworth as Emilio, Patricia Bardon as Arsace, James Laing as Armindo, Stephanie Windsor-Lewis as Rosmira and Matthew Durkan as Oronte. The opera was sung in Amanda Holden's English translation and Christian Curnyn conducted. The production, new in 2008, has scrubbed up well with a sequence of strikingly theatrical spaces and 1920s period costumes. It was nice to see the men's suits, for once, looking perfectly in period, and the wig department clearly had fun too. Under conductor Christian Curnyn the whole musical performance was stylish and technically superb, making the evening a stunning musical evening with strong performances from all the leads. I remain less convinced by the production. Though Alden's idea of using Paris in the 1920s makes an imaginative setting, he does not seem to have made the best of it. The 'battle' at the opening of Act Two, with its obsession with the flat's one lavatory,, was inadequate and by Act Three's duel Alden seemed to be throwing everything at the production. 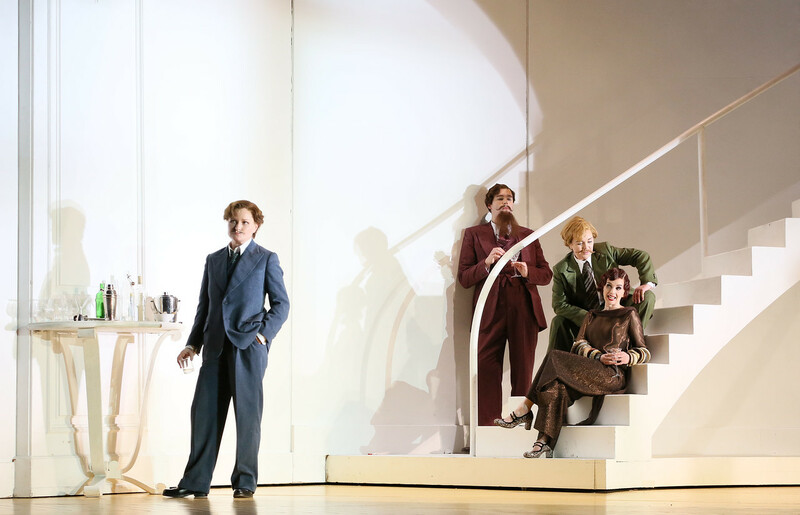 Though Partenope is a comedy, it is very much a comedy of character, satirising the expected opera seria stereotypes. But Alden, with the aid of Amanda Holden's witty translation, has added layers of verbal and physical comedy which verged on the distracting. 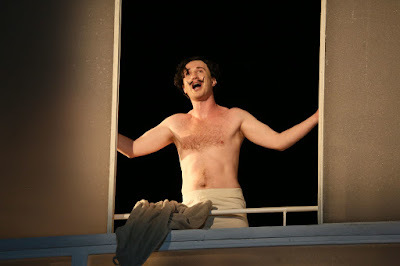 More worryingly, Alden seemed uncomfortable with the da capo aria form, and too often subverted arias with extraneous stage business and even resorted to the tired cliche of turning an aria into a cabaret turn (with Sarah Tynan as a pseudo-Marlene Dietrich, and Rupert Charlesworth's fine turn as a magician). The production seemed to be constantly intent on creating a sequence of entertaining set pieces and what Alden didn't do was use the arias to create a real sense of character. Thankfully the performances from the cast filled in a lot of the gaps, and all concerned performing with a sense of strong engagement and admirably dead-pan commitment, even at the most 'Ministry of Silly Walks' moments. Sarah Tynan was a spectacularly stylish Partenope singing with crystalline fluency and rightly the centre of attention, inhabiting the role both musically and physically. She wore the clothes to the manner born and created a real sense of brittle character; once past her opening aria where Curnyn's fast speed seemed excessive, she combined some pin-point coloratura with lovely lyric moments and singing of great poignancy. Tynan really captured Partenope's wayward charm and changeability. 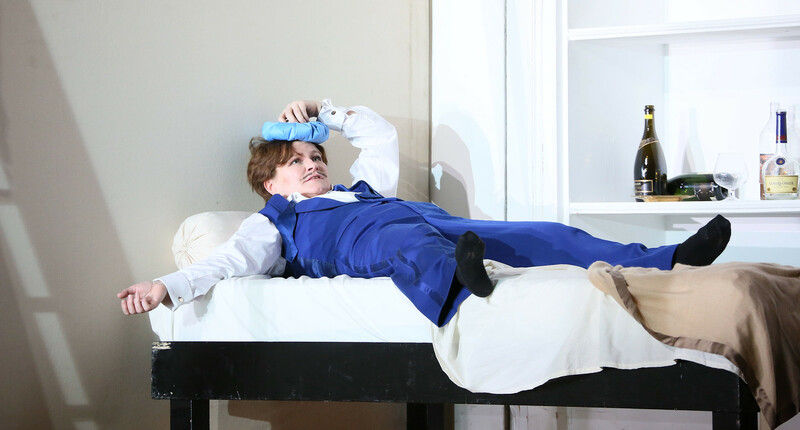 I hope we see her in Handel again soon, how about a revival of Alcina with Tynan as Morgana. 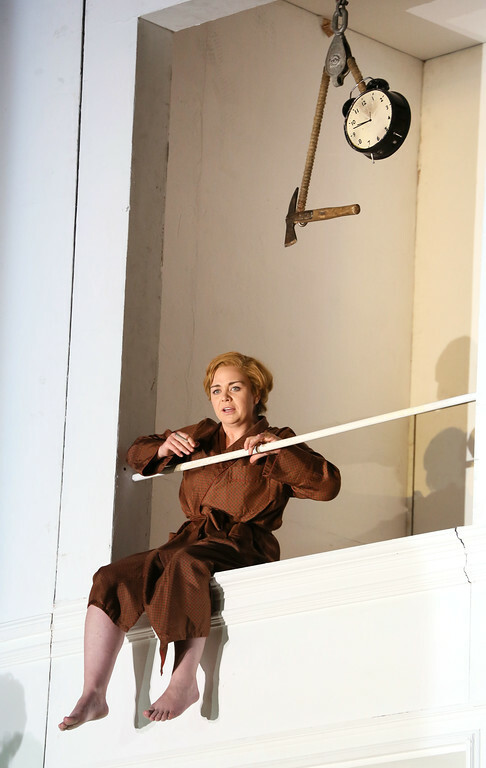 Stephanie Windsor-Lewis made a strong, sympathetic Rosmira, the opera's most complex character. Windsor-Lewis brought out Rosmira's conflict between her love for and anger at Arsace (Patricia Bardon). She was stunning in Rosmira's aria which closed Act One, combining passion and power (though Alden's staging did her little justice). And this was a performance which grew in intensity throughout the evening. Part of Handel's comedy is that there is nothing heroic about the two leading male characters, we only ever see Arsace involved in the toils of love and he never does anything heroic, whilst Armindo is profoundly timid. And both get involved in the unseemly squabble at the end of the battle over who has the credit for rescuing Partenope and capturing Emilio. Stephanie Windsor-Lewis was ably partnered by Patricia Bardon as Arsace, the still centre of the production. 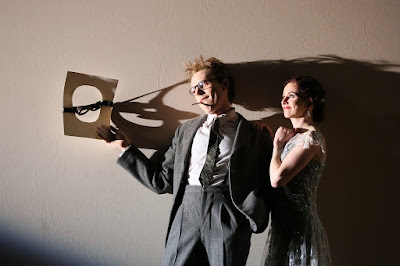 Tempted against himself by Partenope, yet still loving Rosmira, Bardon concluded Act Two with a powerful aria full of brilliant fireworks, and continued into Act Three showing how less really can be more when it comes to performing Handel. A stunning performance. Armindo is the most comic character, as Handel plays the role against type with Armindo being a timid wimp yet he gets the girl at the end. James Laing was completely delightful in the role, and his dumb-struck expression in Act Three when he did get the first was priceless. And Laing is a fine Handel stylist too, singing Armindo's arias with aplomb. Rupert Charlesworth took over the role of Emilio at less than a week's notice (Robert Murray had to stand down on doctor's orders), but you would not have known it. His voice brought a dark glittering brilliance to Handel's virtuosic writing, particularly in the thrilling Act Two aria. Emilio is always an on-looker, and having the character as Man Ray emphasised this though I wondered how much an audience member would deduce if they had not read the programme book. Matthew Durkan was a strong Oronte, playing the Lytton Strachey idea for all it was worth, and singing Oronte's one aria with style. In the pit Christian Curnyn presided over a highly stylish account of the score from the very opening notes, with the English National Opera orchestra unrecognisable from the body which usually plays full-blooded Romantic music. It was such a pity that the level of the pit was not raised so we could see them better. Delays in both intervals meant that the performance over-ran considerably and a number of people left at the second interval, a reminder that full length Handel opera remains something of a challenge outside of festival conditions. But I was pleased to note that ENO included two intervals so that the structure of the piece was recognised. This was a strong revival, British Handel opera at its best, and it was clear that Christopher Alden's vividly (over-) theatrical production pleased many in the audience.